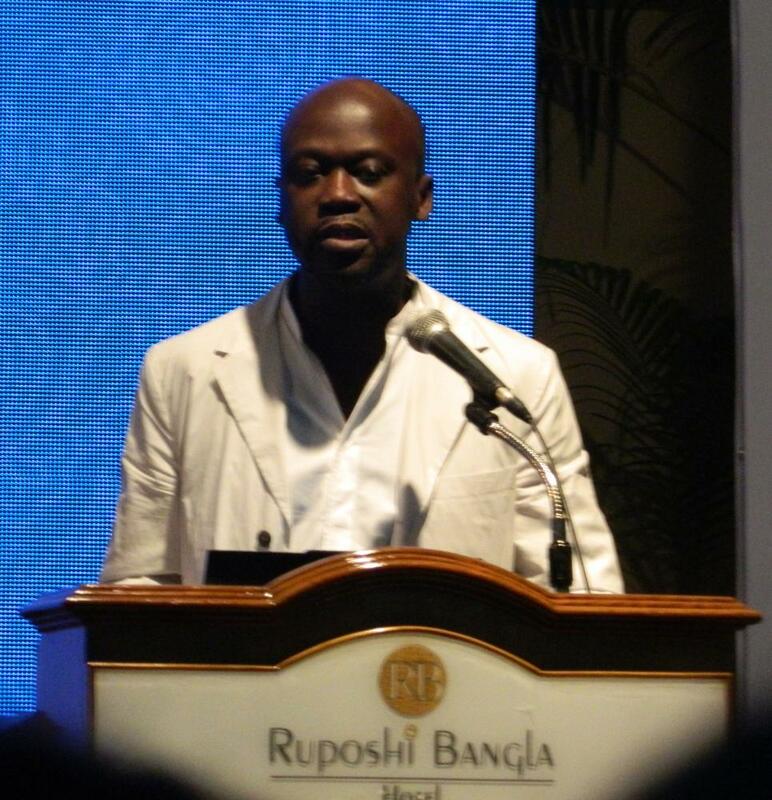 Internationally acclaimed British-based architect David Adjaye was born in Dar es Salaam, Tanzania, on September 22, 1966, the son Affram Adjaye, a diplomat from Ghana, and Cecilia Adjaye, also a Ghanaian national. Because of the nature of his father’s work, as a child David experienced living in several African and Middle Eastern countries. At age 14 Adjaye’s family settled in England where, unlike anything he had encountered in international schools in other countries, he was subjected to racial harassment by white youths. After completing a one-year foundation course at Middlesex University, Adjaye earned the bachelor’s degree in architecture with first-class honors at the London South Bank University in 1990, and the master’s degree in architecture at the Royal College of Art in 1993. In between attending school he worked at the firm of Tchaik Chassay in London, Eduardo Souto de Moura in Portugal, and spent a year in Japan studying architecture and Buddhism. Later in the 1990s Adjaye designed sets for a music video by the British-American rock band The Pretenders; a wine cellar for David Gilmour, lead guitar player for Pink Floyd; a house for fashion designer and couturier Alexander McQueen; and a variety of other projects, among them cafés and a noodle house in Soho. Also, in partnership with William Russell, he formed the architectural firm of Adjaye & Russell. In the year 2000, David founded Adjaye Associates, which currently employs 35 architects with offices in New York, London, and Berlin, Germany. Adjaye’s Electra House in London, designed for an artist couple in 2000, brought him considerable attention, eliciting comment from the esteemed architect Richard Rogers who proclaimed him “one of the best architects of his generation in Britain.” Greater notoriety came in 2005 with his two Idea Stores in London’s East End, inspired by the Pompidou Center in Paris, France, with stairways located adjacent to front walls that allow for more interior space. Much of his talent has been utilized to construct moderately expensive homes for certain individuals and buildings that benefit minority race communities, but increasingly he has won contracts to design large structures worldwide such as the Nobel Peace Center in Oslo, Norway, in 2005; Rivington Place and the Bernie Grant Art Centre in London in 2007; the Museum of Contemporary Art in Denver, Colorado in 2007; the Skolkovo Moscow School of Management in Russia in 2010; and the Aïshti Foundation in Beirut, Lebanon, in 2015. In 2016 the Smithsonian National Museum of African American History and Culture in Washington, D.C., selected Adjaye as lead designer and Philip Freelon as architect of record. In addition to designing homes and larger buildings, Adjaye has also designed furniture and textile patterns, and he authored the books David: Adjaye Houses (Thames & Hudson, 2006) and David Adjaye: A House for an Art Collector (Rizzoli, 2011). Adjaye’s recognitions include the Royal Institute of British Architects Bronze Medal, Order of the British Empire (OBE) awarded by the Queen of England, W.E.B. DuBois Medal, and the Massachusetts Institute of Technology Award worth $100,000. He has been a visiting professor at Yale, Harvard, and the University of Pennsylvania. In 2014, Adjaye married Ashley Shaw-Scott, a California-born Stanford-educated former model and global business consultant. Calvin Tomkins, “A Sense of Place,” The New Yorker (September 23, 2013); Jackie Craven, “David Adjaye -- Born in Africa, Designing Architecture for the World” at https://www.thoughtco.com/david-adjaye-designing-world-architecture-177362; Dodie Kazanjian, “With His New Historic Design, Architect David Adjaye Has Hit the Top,” in Vogue (June 21, 2016), also at https://www.vogue.com/article/architect-david-adjaye-national-museum-of-african-american-history-and-culture. Calvin Tomkins, “A Sense of Place,” The New Yorker (September 23, 2013); Jackie Craven, “David Adjaye — Born in Africa, Designing Architecture for the World” at https://www.thoughtco.com/david-adjaye-designing-world-architecture-177362; Dodie Kazanjian, “With His New Historic Design, Architect David Adjaye Has Hit the Top,” in Vogue (June 21, 2016), also at https://www.vogue.com/article/architect-david-adjaye-national-museum-of-african-american-history-and-culture.